Islamabad: Pakistani Hindu community will have a personal law for the first time as the Senate has passed 'The Hindu Marriage Bill 2017'. The bill, approved by the National Assembly on September 26, 2015 and passed on Friday, will likely get presidential assent next week to become a law, Dawn online reported.According to the bill, Hindu women will get documentary proof of their marriage. After approval, the law will be applicable on Pakistani Hindus in Punjab, Balo­chis­tan and Khyber Pakhtun­khwa. 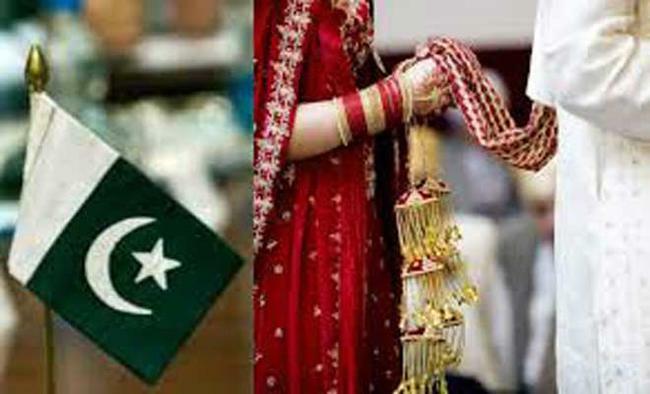 Sindh province already has its own Hindu marriage law.The bill presented in the Senate by Law Minister Zahid Hamid faced no opposition or objection. It was approved by the Senate Functional Committee on Human Rights on January 2 with an overwhelming majority.However, Senator Mufti Abdul Sattar of the Jamiat Ulema-e-Islam-Fazl had opposed the bill, saying the Constitution was vast enough to cater for such needs. Committee chairperson Senator Nasreen Jalil of the Muttahida Qaumi Movement on Friday said: "This was unfair. Not only against the principles of Islam but also a human rights violation that we have not been able to formulate a personal family law for the Hindus." Senators Aitzaz Ahsan, Jehanzeb Jamaldini and Sitara Ayaz, supporting the bill, said it was related to the marriage of Hindus living in Pakistan and had nothing to do with Muslims. Ramesh Kumar Vankwani, who had been working relentlessly for three years to have a Hindu marriage law, said: "Such laws will help discourage forced conversions and streamline the Hindu community after the marriage of individuals. Vankwani said it was difficult for Hindu women to prove their marriage.The law paves the way for 'Shadi Parath' -- similar to Nikahnama for Muslims -- to be signed by a pundit and registered with the relevant government department. However, the Hindu parliamentarians and members of the community had concerns over one of the clauses of the bill that deals with "annulment of marriage".According to the bill, one of the partners can approach the court for separation if any of them changes the religion. "The separation case should be filed before the conversion as it gives an option to the miscreants to kidnap a married woman, keep her under illegal custody and present her in a court that she has converted to Islam and does not want to live with a Hindu man," Vankwani said. The bill is widely acceptable for Pakistani Hindus and relates to marriage, its registration, separation and remarriage, with the minimum age of marriage set at 18 years for both boys and girls.